Denny O’Neil still as relevant as ever! 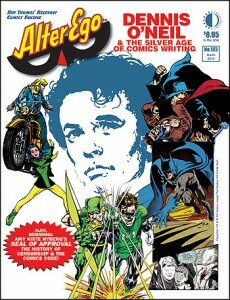 In ALTER EGO #123, we’ve got a special focus on DENNY O’NEIL’s Silver Age career through the mid-1970s, from Marvel (Dr. Strange, S.H.I.E.L.D.) to Charlton (Wander, “Children of Doom”) to DC (Green Lantern/Green Arrow, Batman, The Shadow, Wonder Woman, Superman, JLA)—with assorted cool artifacts from ADAMS, KALUTA, SEKOWSKY, LEE, GIORDANO, THOMAS, SCHWARTZ, APARO, BOYETTE, DILLIN, SWAN, DITKO, and others. See what editor ROY THOMAS has dug up on the Denster; the issue is shipping now, and can be ordered HERE. This entry was posted in TNT on 14 February 2014 by Mr. Morrow. This entry was posted in TNT on 3 February 2014 by Mr. Morrow.